ADiE enriches shared decision making between patient and providers by digitizing and indexing care preferences—making them available when it matters most. ADiE is a cloud-based, centralized repository for ACP documents, including POLST, Advance Directives, Power of Attorney, Living Will, and DNR orders of various formats (e.g., EMS DNRs, POST, and MOLST). ADiE bridges the gap between collecting and connecting ACP documents to various providers in a fragmented care delivery system. ADiE’s delivers true interoperability by leveraging existing data exchange standards, such as Carequality, Commonwell, Direct Trust, FHIR, HL7, and APIs. ADiE is a cloud-based solution with a patient-matching infrastructure that includes a complex mapping scheme and process that accurately identifies and matches patient-to-patient and provider-to-provider across systems making it the single source of truth for the patient and all treating providers. 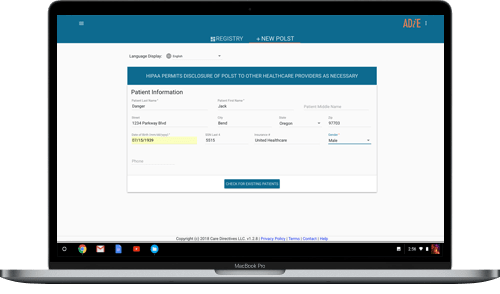 ADiE delivers actionable insights into real-time ACP documentation making it easy for providers to quickly identify patient wishes and apply the appropriate interventions. Our system agnostic ACP platform provides integration and interoperability based on global healthcare information exchange protocols and messaging formats that are plug-and-play compatible with other technology solutions. ADiE eliminates barriers to communicating ACP/AD care wishes and thus improves patient-centered end-of-life care, reduces unwanted care and cost. By connecting to large health information networks – Direct Trust, Carequality, and Commonwell – ADiE’s interoperability is able to connect with over 1.7 million providers across the U.S.- without the costly and time consuming integration build outs.